Automated computerized knitting machine converts cotton or synthetic blend yarn into a finished glove. They are commonly referred to as a string knit work glove. Their popularity has grown substantially due to their low cost, reversibility and conforming comfort. More importantly, the string knit's wide variety of yarn choices meets a wide range of application needs. 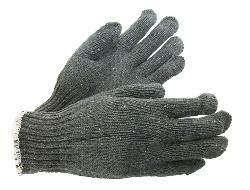 Versatile cotton/poly work glove for light general-purpose use or as a liner for insulation. The knit construction conforms to the hand for excellent dexterity. Elastic knitwrist ensures a snug and comfortable fit. Reversible pattern can be worn on either hand. Mediumweight. Gray color. 60% cotton/40% polyester blend. Size: small. Work applications include parts handling, assembly, maintenance, or as a liner for food processing. 30 dozen per case. Sold by the dozen. Copyright © 2008-2017 Saf-T-Glove, Inc.. All Rights Reserved.